Here we briefly explain what property management is. A property management company is deal directly with tenants which is collecting rents, responding to a tenant complaints and even pursuing evictions. Other than that, they also handling the maintenance and repair issues of a property. A landlord will hired a property manager to handle all the above matters. (of course a landlord can handle that matters by themselves but they are simply have no time). 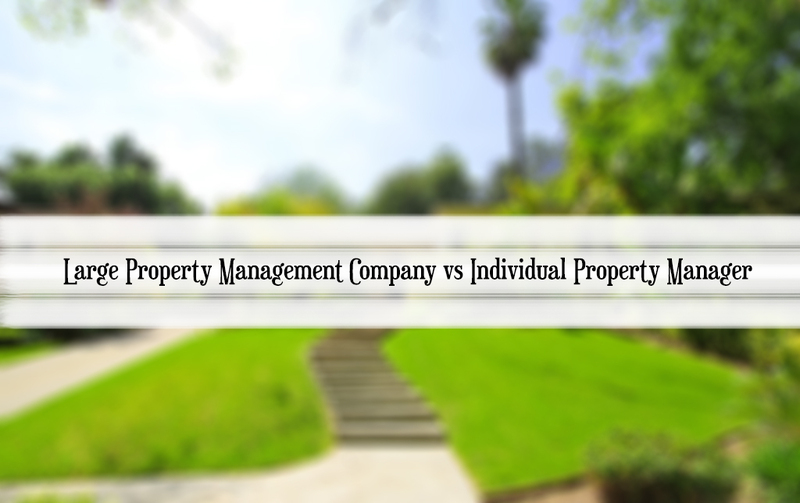 Now, we come back to the question, large property management company or and individual property manager? Which is better? Well, we have summarized the article from Biggerpockets about this topic. So let’s see what they come up with. ➮ The absolute most critical detail about a large property management company is simply how they are set up. ➮ If a large company has been built correctly and is maintained correctly, then there shouldn’t be any major problems. ➮ What constitutes “large”? The “large” ones have had between 1,000-1,400 properties managed at one time. ➮ Use your judgment to decide what is large based on your individual managers and smaller companies having, say, 100 or less properties to manage at once. An individual may only have 10 properties to manage! ➮ large property management companies do have some level of structure and systems. How else would they manage 1,000 properties? ➮ In the case of a property management company, having 1,000 or more properties likely means they either give particular contractors a ton of consistent work or they can afford to have in-house contractors. Most times a company is given consistent work of decent scale, they lower their fees. ➮ So if one plumbing company gets the calls for all plumbing issues of the 1,000 properties, they are probably going to not charge an arm and a leg. ➮ They might be able to charge a lower monthly fee to the owners of the properties because they have so many properties they manage that they can entice owners with lower fees and ultimately draw more in. ➮ A large company have their structure and systems in place. Sure, they may add improvements along the way, but the bulk of the growing is done already. You don’t have to worry about your arrangement or setup with them changing drastically. ➮ There are probably bosses and managers, systems in place, and rules for employees to follow. ➮ But for the most part, that structure of the company keeps things flowing so there’s not a lot of wiggle room for how your property is managed. ➮ In my experience with large property management companies, I’ve not been able to either get the same person on the phone twice or get information from the one person I do talk to. Getting a different person on the phone every time makes for extremely inefficient question-answering. Or you get the same secretary on the phone, but she hasn’t a clue and swears she’s trying to get the info, but you continue to not hear back from her. ➮ You can probably see how much potential for information getting lost in translation there is. Nobody knows what is happening with your particular property off the top of their heads, so they are reliant on either finding the information in their “system” or finding someone who does know the answer. ➮ It’s just not feasible for a company this size to be so closely tied into your properties that they know everything immediately or can even answer your calls directly. ➮ Speaking of not being able to get VIP service on your single little property, your property is basically going to enter the “system” when it needs anything. Maintenance, tenant calls, problems, etc. ➮ Efficiency will be dependent on the company’s systems and processes and the availability of the employees or contractors necessary to fix the problem. And tying efficiency back to communication, how efficiently are you able to get answers or responses to your questions or inquiries? So efficiency covers a lot of ground. ➮ if you have particular preferences for how you would like the management of your property to go, you may not have a lot of negotiating room with the bigger companies. ➮ They have necessary processes in place to be able to manage so many properties, and even if they want to, they may not be able to accommodate special requests that fall outside their established processes. ➮ Can you imagine 1,000 special requests? It’s not feasible. There may be some budge room, and some companies may offer different package options, but there’s a good chance a large company can only deviate so far. Now you’re get to know what large property management company is as well as it’s pros and cons. Next, we continue to discuss about an individual property manager. 1.An actual individual who is maybe a real estate agent or does something else in real estate to have the knowledge (and licensing, if applicable) to do property management. ➮ Maybe he takes on properties just through referrals or some other small network. He may only manage a handful of properties — probably not more than 20 or 30. 2. A small property management company, likely having only one actual property manager and maybe one or two secretaries and a go-to handyman. ➮ He can probably handle more than 20 or 30 properties — maybe closer to 100. Maybe he has systems in place, maybe not, or maybe they are just extremely basic and simple. ➮ He/She is very likely to know the answer to any question you have about one of your properties right off the top of his head. ➮ There is the same person will answer your call every single time and be able to tell you the answer to your question. ➮ Individual managers don’t necessarily have or need set, strict systems in place because they can manage all of the properties by hand without them. Therefore, they can usually be pretty flexible to tailor things for what you need. ➮ The property manager can get necessary things done for it very quickly. In some cases, though, efficiency could be a con with the individual property manager because it’s possible he doesn’t have the man-power for it. ➮ I’ve had the experience where the individual has killer contacts in the industry that he knows personally who can come out and do work for you cheaply. On the flip side, because the individual property manager can’t give a handyman or contractor work on as big of a scale as the bigger companies can, they may not be able to get the same lower rates. ➮ An individual can change business or do what they want with no major threat of repercussion. As in, they don’t have a boss to fire them or manager to tell at them what to do. ➮ Obviously, they can’t do totally crazy things outside of contracts or whatever, but things don’t always have to fit a certain standard. If things are great in the beginning but start going downhill, there’s not much you can do about that. ➮ This one bit me hard last year. I had an individual property manager on my properties who I loved for years. His communication was great, everything was smooth and efficient, he saved me lots of money, and I could always get him on his cell phone — until I couldn’t. With no warning, things seemed to change. I had some problems, and when I talked to him on the phone, he explained that he had grown so much that he was experiencing some growing pains and not to worry — all would get fixed. ➮ This manager placed such a bad tenant in my nicest rental property that the entire property had major damage to it — and the manager had no clue! I would say this is an example of what can really go wrong with growing pains. ➮ The manager didn’t know how to grow a business, so things started getting sloppy. That would be OK if he didn’t convert in the process. Somewhere down the line, he had gone from this amazing, nice and friendly manager who I had met on several occasions to this monster who wouldn’t answer my calls, tell me anything about my properties, and had no idea one of my properties had basically been set on fire. After finished reading this article, we’re get to know that the author has no perfection equation between them both but the author has share his/her experience to us. And now you can understand the pros and cons about large property management company and individual property manager. Which one better? You should decide your own.